My wife and I took 5 friends down to Antigua this year to do some quantitative easing in that fine country. This review of our boat, the Lagoon 42, is based on my experience showing and moving them in Lauderdale as well as from this 7 day charter with Dream Yachts out of Jolly Harbor. Let me get this done with at the start. Lagoons are not the best quality catamarans. Hey they or as a close second to Fountaine Pajot might be near the bottom of quality for mass production catamarans depending on the model. But for what they lack in quality, they make up for in outstanding space and light inside. 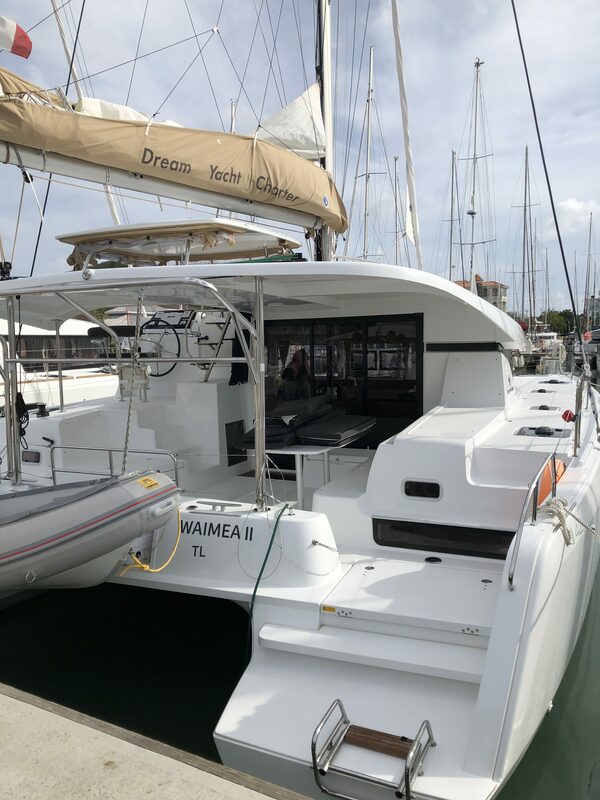 They have gotten better and better at maximizing space, so much so that in the 2018 Lagoon 42 we chartered there were 4 good sized heads along with the 4 cabins and 2 pilot berths forward. The salon is huge and open to the equally huge cockpit. The Lagoon 42 is a fun charter-party boat. Pop a bottle of champaign, put a lobster on the grill, and read on for my review. Lagoon was born out of Jeanneau Technologies Avancees in 1984 where they became known for high performance ocean racing catamarans. The oldest Lagoons I find in the brokerage records are from 1989 when they started making charter catamarans. These monsterous 55’s still are around and often in terrible condition. They refit one on the face dock of my office for a number of years. After the success of the 55’s, Lagoon launched 37 and 42 foot models built by TPI (old Pearson) in Rhode Island. 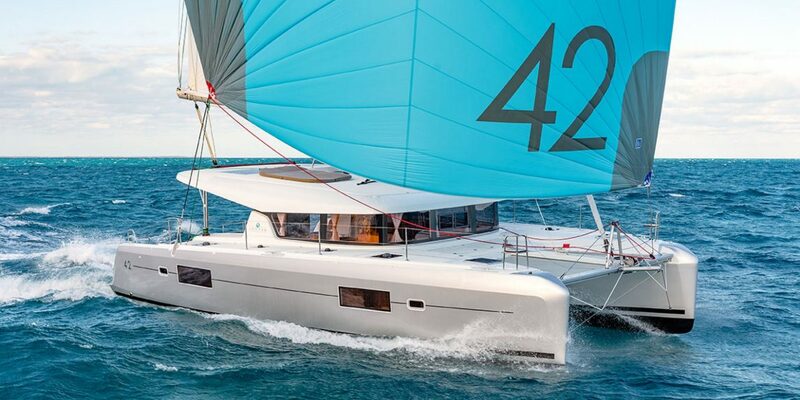 The 42 was nominated best catamaran and best boat of the year in 1991 by Sailing World. These smaller cats were cross branded as the Moorings 3700 and 4200 to expand on their charter relationship. This was before Moorings switched to their current Leopard only focus. Based on brokerage records TPI built Lagoon until at least 1996 when Group Beneteau took over the Lagoon brand. During this period in 1995, Waterworld, one of my favorite movies, starred Kevin Costner on a Lagoon built trimaran. Lagoon had become a world leader and was riding the still rising wave of sailors transitioning to the superior space of catamarans over monohulls. In 1997, the Lagoon 410 and 380 kicked off what we think of Lagoons today with the distinctive vertical salon windows. From then until 2003, Lagoon launched the popular series of 380, 410, 440, 470, 500, and 570 catamarans. The 440 was introduced in 2004 and became particularly popular. We have a review of that model from my delivery of one from Fort Lauderdale to Annapolis some years ago. They also started building power cats in this period starting I think with a Lagoon 43. The evolution continued of building larger and larger catamarans until 2010 when they revamped the interiors with design company Nauta Design. One of the latest and greatest is the Lagoon 42 design which was launched in 2016. 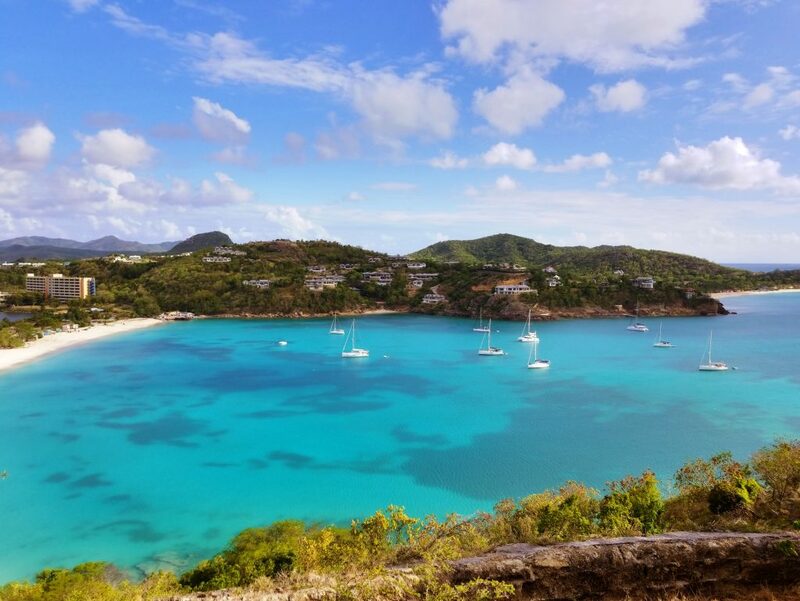 Lagoons come in 2 layouts: charter and owners. 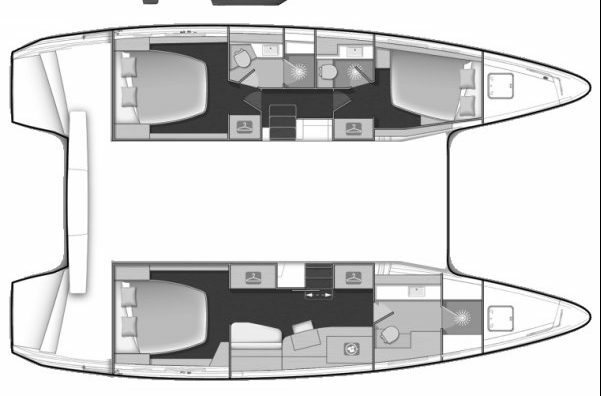 The main difference being in the owner’s version one of the hulls like in the drawing above is one large stateroom while the other side has two cabins and two heads. In the charter layout, both hulls are 2 cabin layouts. The aft heads are larger than the forward heads. The biggest compromise allowing Lagoon to maximize their interior volume is the placement of the rudders behind the saildrives (more on this in the underway section later). This allows the aft cabins to be quite large and nice. It is really great to not share a head for us squeamish americans when we are chartering with friends. Like most cats, rig height is not intercoastal friendly at 68′. Draft is excellent at 4′. It is amazing to have such small draft on a decent sized cruising boat. Draft is another reason for the rapid shift from monohulls to catamarans in the private owner market. She is beamy at 25′. To my eyes, the modern look of the 42 is a big improvement on the older Lagoons. I never thought the older models were the most attractive of boats. Classic looks might be cool on a monohull but not on a cat. The tapered edge of the flybridge gives it more flair. Unlike the old Lagoon 42, the flybridge comes all the way back with a cut out section for the helm. This flybridge makes a large lounging area above the cockpit for getting sun or stargazing. She does not seem that big at dock. Her cockpit in contrast is gigantic with excellent storage, an ice maker on this charter model, a large table with seating, and easy access to the helm. There are two large windows and accompanying portholes on both port and starboard topsides. Our charter model had a nice davit setup where you could lower the dinghy on a cross bar on a winch. The davit line lead to this winch was poor which was one of the small signs of poor attention to detail by Lagoon which bothered me. At some point the clutch on these Lagoon 42’s will break off and cause grief. The best part about the deck is the the skylounge. The portside helm leads nice to a top deck area which my wife and the other guests enjoyed laying out on at anchor or underway. 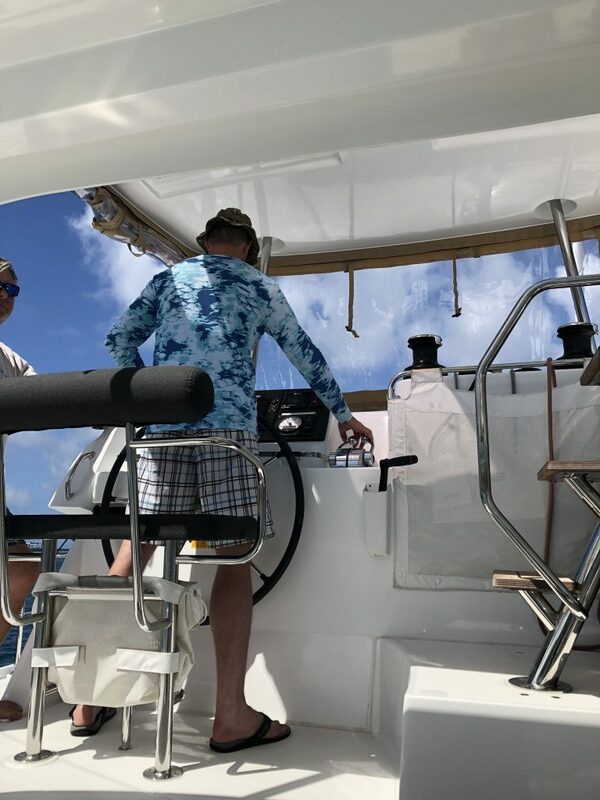 This flybridge area also makes access to the mainsail a lot easier than on some other catamarans where you have to climb aloft to flake the main. The foredeck area is pretty standard with large trampolines and deck storage lockers where the windlass, chain, and water tankage live. There is great storage in the lockers for snorkle gear and extra water. One issue we notice setting off and also had when mooring is the poor placement of bow lights. When you grab a mooring on the 42 these lights are in just the wrong place for the bridle. A prior charter had broken one of the nav lights and we broke the other through no fault of our own. It is another poorly thought out placement. There is no way to avoid the bridle rode chaffing hard against and eventually breaking off the nav lights. The sliders open almost all the way to make the salon and cockpit one large area. I don’t know how they have done it, but this is one large salon area for a 42-foot catamaran. The table comfortably accommodates 8 people and no one felt any need for more space amongst an inexperienced crew I had on my charter. The galley has good storage and there is additional storage under the dinette seating and salon sole. Visibility as your would expect for a Lagoon is excellent and 360 degrees. Down in the cabin areas, the aft berths are larger and have bigger heads as well. But I was quite comfortable in a forward cabin with my honey. The forward cabin had more motion at anchor but more breeze as well, and there were some crew complaints of stuffyness in less windy anchorages in the aft cabins. The berths are plenty large enough. We used the additional pilot berth space forward for storage of our bags. I am not sure if I would be comfortable sleeping up there with motion and claustraphobia. I think 8 people was a good number for chartering on a Lagoon 42. Engines were Yanmars and aft of the cockpit under the transom steps. Here is the compromise of the rudders being aft of the propellers. This maximizes space yet makes driving these boats annoying. When you are in close quarters, make sure you use your throttles and lean your body into the helm to stop the squirlyness of the rudders when going into gear. You lose maneauvering power with the aft most rudders. She was easy to run otherwise with good visibility and good power. Fuel burn was low with only 10 gallons burned over 7 days of encircling Antigua. And most of that burned to top off the batteries. Great space and easy to use setup on this 2018 Lagoon 42 charterboat. We had a great time over 7 days out of Jolly Harbor with Dream Yachts who I thought were excellent to charter from. The crew loved it and everyone without sailing background felt comfortable and was impressed by the luxury of modern sailing design. Downside is a loss of performance for those with more sailing experience. That saying I would have lobster and champaign for a week a Lagoon 42 again with max 8 people in any port in the world. Please contact us at Jordan Yachts for more information on Lagoon 42’s. Previous Previous post: Transitioning to a Cruising Lifestyle; My family’s key recommendations.